DEEP is a VR experience controlled by deep breathing. Players explore a mysterious underwater world designed and proven to help sooth, calm and relax. As you breathe in, the lights brighten and the plants open in unison in time with you. Take a deeper breath and you will rise up from the ocean floor drifting across the strange landscape. Exhale and you gently float back down. Crafted with the guidance of a team of behavioural scientists, DEEP is growing into a therapeutic refuge as well as an increasingly wonderful game. 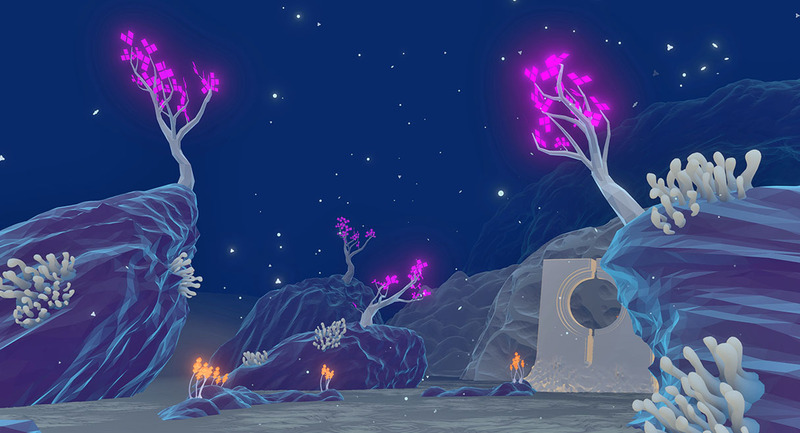 Meditative VR is here at last. Owen Harris is a Game Designer, VR designer and lover of all things playful. When not working on DEEP, he designs games and VR experiences for the University of Cambridge, Cold Spring Harbor Laboratory, Gambrinous and others. He teaches Game Design in DIT and has spoken all over Ireland and Europe about games, virtual reality and on the intersection of health and playful experiences. He is a founder of Imirt, an organisation set up to improve the quality and visibility of Irish games, and runs the local community game design event dubLUDO. His mission is to bring about an increased awareness of the value of playfulness in everyday life. Monobanda PLAY is a foundation / art collective, making projects that explore human expression and meaningful interaction. Our core aesthetic is ‘play’. A state of being that all human beings share, and facilitates our best traits, like creativity, communication, motivation and self confidence. Inspired by the social interactions that are found on a playground or in a sandbox, where creativity and imagination run free, we make projects that inhabit the space between the virtual and physical world.